I'm reading this because it's a sequel to Strange Apparitions, reuniting the all-star team of Steve Englehart, Marshall Rogers, and Terry Austin, and bringing back Silver St. 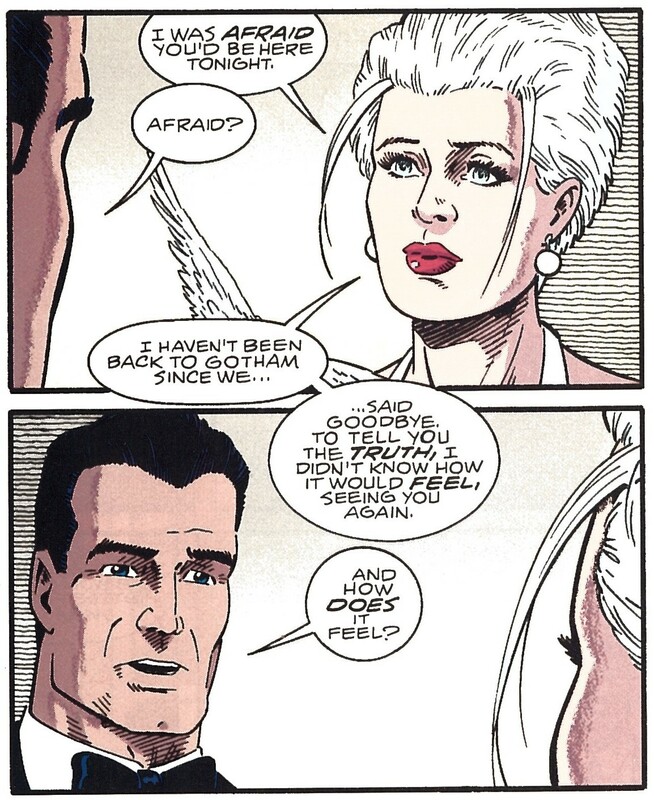 Cloud, one of the great loves of Batman's life, now engaged to Senator Evan Gregory, now running for governor. 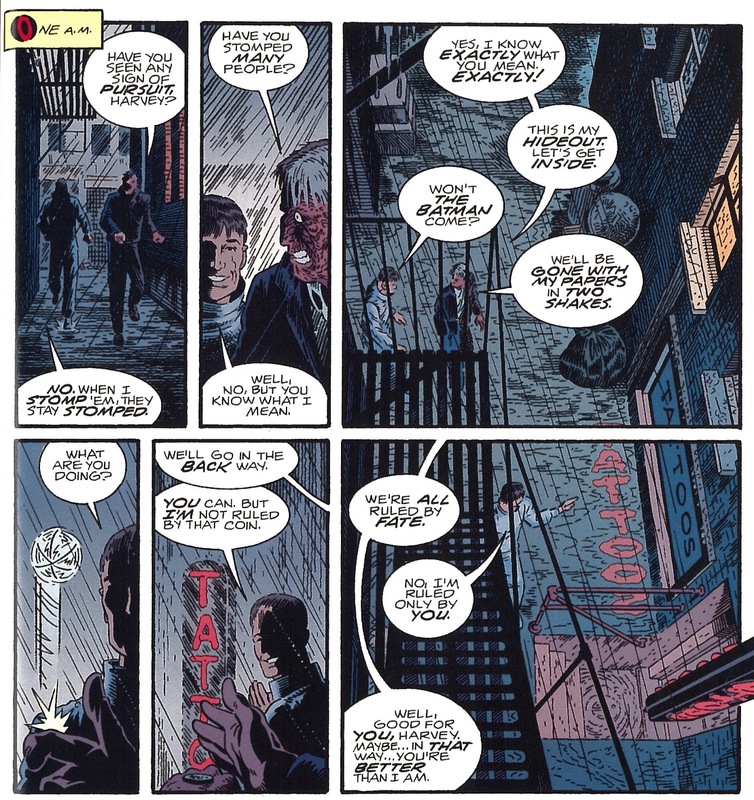 Strange Apparitions wove a thread about Boss Thorne through its various issues; Dark Detective weaves in Gregory's bid for office, especially the Joker's declaration that he'll also be running. 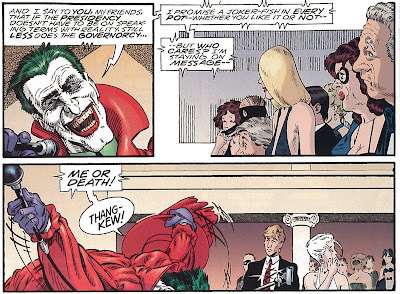 Meanwhile, Bruce's meeting with Silver rekindles old feelings, and Two-Face and the Scarecrow both put in appearances. Word and image. WORD AND IMAGE! Sometime when you get the band back together, they don't play as well: Dark Detective is not quite as grabbing as Strange Apparitions, but it's still very good. 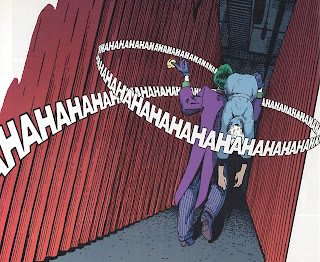 Rogers and Austin are still an unbeatable Batman art team, capturing the twisted gloom of Gotham in all its splendor. They're slightly let down by Chris Chuckry on colors, who makes Silver St. Cloud's hair white instead of, well, silver, which I found very distracting. 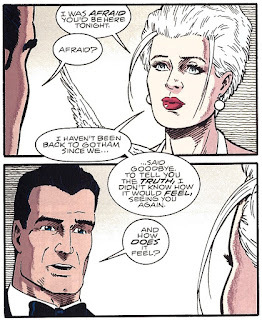 Bruce Wayne kind of looks adorably awkward here. What really makes Englehart a great Batman writer is his grasp on the villains: his Joker is not the motiveless terrorist of A Death in the Family, but rather follows a twisted logic all his own. In a weird way, he really does want to be governor, and he follows the logic through to its conclusion, including his magnificent slogan "VOTE FOR ME OR I'LL KILL YOU." At first he won't kill Gregory because he wants to win "fairly" (as he defines it). But soon he gets bored and decides to kill Gregory anyway; something about the whole process makes a weird sort of sense, which makes it perfect for the Joker. If anything, this subplot is even more relevant and even less startling here in 2016. Don't you kind of feel sorry for Two-Face? The beats of the main plot are a bit generic: Bruce and Silver fall back in love, Bruce is terrorized by some memories of his past, Silver is captured by the Joker. This is all very well executed, but you've seen a lot of it before. Alas, the ending seems to set you up for a third story that could have built on this generic foundation in new ways, and indeed one was planned but never published. Given that Rogers is dead now, one supposes it never will happen, even though Englehart scripted the whole thing. Which is a shame, as Englehart/Rogers/Austin remains one of the best Batman teams despite only doing twelve issues together across thirty years! Next Week: The very end of Batman... Year 100!